ANKARA - Ousted Egyptian President and Brotherhood leader Mohamed Morsi, currently in jail in Egypt, is among world leaders who have congratulated Turkey's president elect Recep Tayyip Erdogan's success in Sunday's presidential election. The congratulations flooded in on Monday, a day after Turkey's outgoing Prime Minister Erdogan got 51.79 percent of the vote, according to Turkey's Supreme Election Board, and was elected to a five-year term as president in the country's first directly elected presidential poll. 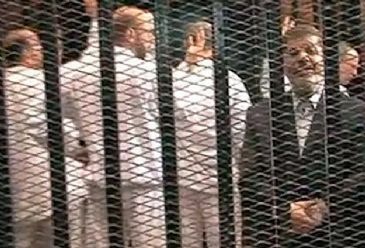 Morsi – currently in prison on criminal charges that his defenders say are trumped up, but who is known to have close relations with Erdogan's ruling AK Party – congratulated Erdogan through his office. Earlier, the spokesman for the the UN Secretary General Ban Ki-moon also praised the election of the new president of Turkey by direct voting. “The Secretary-General commends Turkey on this historic vote, the first direct presidential election in the country's history,” Farhan Haq told Anadolu Agency in New York on Monday. German President Joachim Gauck congratulated Erdogan on his victory, wishing him "health and success" during his presidency. German Chancellor Angela Merkel sent a congratulatory message to Erdogan on his victory, saying : "At present we have to overcome difficult challenges in the region. Turkey has a great importance in this regard." "For your responsible tasks, I wish you success, perseverance and strength." Iraqi President Fouad Massoum, French President Francois Hollande, Iran's President Hassan Rouhani and Greek Prime Minister Andonis Samaras also called Erdogan to congratulate him on his win. Lebanon's former President Amin Gemayel was among other leaders who congratulated Erdogan, according to Lebanon's National News Agency (NNA). Gemayel expressed hope that the election results would help solve regional problems and serve bilateral relations between the two countries. Bulgarian President Rosen Plevneliev also expressed his congratulations to Erdogan, according to a statement released by his office. "Do accept my most sincere congratulations on your winning presidency," Plevneliev said. Kosovan Prime Minister Hashim Thaci also sent his congratulatory messages to Erdogan, wishing him success in his new post. "The Republic of Kosovo will always remember the role Turkey played in the independence of Kosovo and the support it has given to Kosova's economic and democratic development," he said. Afghan President Hamid Karzai also congratulated Erdogan and said Turkey had developed rapidly under Erdogan's government. "I believe Turkey will further develop with Erdogan being the president," he added. Meanwhile, many party leaders from Bosnia and Herzegovina, Albania, Tunisia also congratulated Erdogan. Yemeni Nobel Peace Prize winner Tawakkol Karman said Turkey had thrown another punch at countries which were in search of taking revenge on Arab Spring countries, in a tweet where she congratulated Erdogan on his election. Kazakh President Nursultan Nazarbayev sent a letter of congratulations to Erdogan. The President of the European Council, Herman Van Rompuy, and President of the European Commission Jose Manuel Barroso also congratulated PM Erdogan. In a joint statement they said: "Turkey is a key partner for the European Union: a candidate country negotiating EU accession, a neighbor, an important trade partner and a foreign policy ally. We look forward to enhancing our cooperation in all these areas." Montenegro Islamic Union President Rifat Feyzic told Anadolu Agency that Erdogan's win in the presidential election would have a positive influence on relations between Montenegro and Turkey, as well as the Islamic Union. "We expect cooperation with Turkey to rise. Turkey is in good relations with all the Balkan countries, including Montenegro and I hope these relations will continue," said Feyzic. Kurdish Regional Government (KRG) Prime Minister Nechirvan Barzani called Recep Tayyip Erdogan to congratulate him on his win in Sunday's presidential election, according to a statement on KRG's official website. Barzani wished Erdogan and Turkey success, saying "We are waiting for Erbil-Ankara relations to improve and we believe that Erdogan's presidency will be successful, taking into account solving the process of the Kurdish issue." Ekmeleddin Ihsanoglu, the joint candidate of Turkey's two largest opposition parties, received 38.44 percent of the vote, and Selahattin Demirtas, candidate of the pro-Kurdish Peoples' Democratic Party, won 9.76 percent. The presidential election, sandwiched between March’s local election and the forthcoming general election in June, was the first presidential poll to be decided by popular vote. Voter turnout was 74.12 percent.